Garfield! You've never looked better! 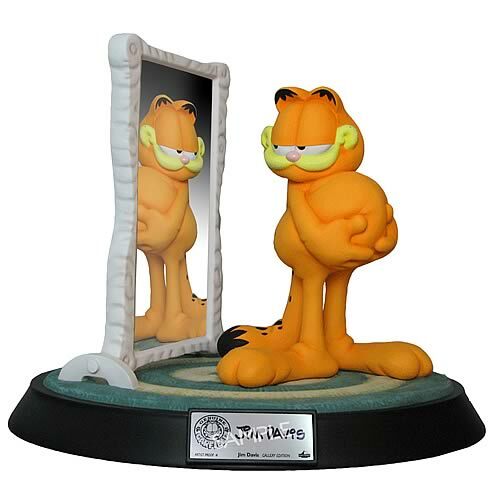 The Garfield Gallery Edition Signature Series Statue is interpreted in 3-D by sculptor Ruben Procopio from an original drawing by Garfield creator Jim Davis. This exceptional polystone sculpture captures Garfield in all his self-indulgent glory. ​The statue stands 13-inches tall, is a numbered limited edition of just 500 pieces, and includes a certificate of authenticity and numbered plaque personally hand signed by Jim Davis! The cubes, which appear in the movie, Super 8, are the building blocks of the alien's spaceship. Using the 3-D solid model files used to create the screen-used props, QMx has created an exact replica of the Argus Cube in passive mode. With a polystone core, the exterior of the cube is plated with a smooth pearlescent coating, perfectly replicating the semi-organic, semi-metallic finish of the hero prop. ​Each cube measures 2 inches (50.8 mm) on each side and weighs approximately 8 ounces (0.23 kg).